Posted under Health Guides. Updated 28 November 2017. You may have heard that eating fruits (and vegetables) is good for you, but why? Eating a diet rich in fruits and vegetables is associated with a decreased risk of some chronic diseases, such as type II diabetes and high blood pressure. Fruits contain many vitamins and minerals such as fiber, folate, potassium, and vitamin C. They are also a healthy, low calorie alternative to other foods that contain fat, added sugar, and sodium. While fruit does contain sugar, it is natural sugar, not added sugar. A fruit is a part of a plant that contains the seeds and develops from the flower. With this definition, squash, bell peppers, and green beans would technically be considered fruits. However, people do not typically consider these to be fruits. The most popular definition of fruits is that they have a sweet taste compared to vegetables that have more of a savory flavor. How much fruit is recommended in a day? The Dietary Guidelines for Americans recommends consuming about 2 cups of fruits per day. This can include fresh fruits, frozen fruit, canned fruit (choose those canned in water or their own juice), dried fruit (1/2 cup is equal to a 1 cup fresh equivalent), and 100% fruit juice. Please see the ‘Sugar Sweetened Beverage’ guide for more information on fruit juice. Making half of your plate fruits and vegetables at mealtimes can ensure that you get enough fruits and vegetables. Is the color of fruit important? Yes! Fruits (and vegetables) have many different colors that relate to their different nutrients, specifically phytochemicals. Phytochemicals, or antioxidants, are compounds that help protect the body from stress, cancer, and other diseases. They can also boost the body’s immunity! Because they provide different nutrients, no one color is better than another. The next time you are in the grocery store, think about the colors of the fruits and vegetables that you are selecting and try to select a variety that represents all colors. 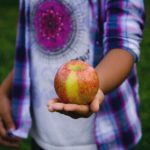 How can I eat more fruit? Keeping fruit in a bowl on the counter is a helpful reminder to eat more fruit! Placing washed and cut fruit in containers at the front of the fridge makes it easier to eat fruit as a snack. (Helpful tip: Wash berries right before you eat them to avoid wilting/softening) Packing fruit, such as a banana, grapes, or an apple and taking them with you is a great snack and an excellent way to increase your fruit intake. However you manage to work fruit into your day, make sure to have at least two servings (daily) for the best health benefits from what’s been called “nature’s candy”!